Consumers are the driving force of retail. The foundation of smart retail is the progress of science and technology. The development direction of retail is guided by their interaction – what new products emerge and how they align with consumer demand. Technologies are applied in various retail scenarios not only to enhance consumer experience, but diversify data collection, supporting data-based operations management. Technology and retail are combined, creating new business modes, such as unattended stores. Technology also plays an important role in the logistics infrastructure construction. New retail is digital, omni-channel, and has flexible supply chains. 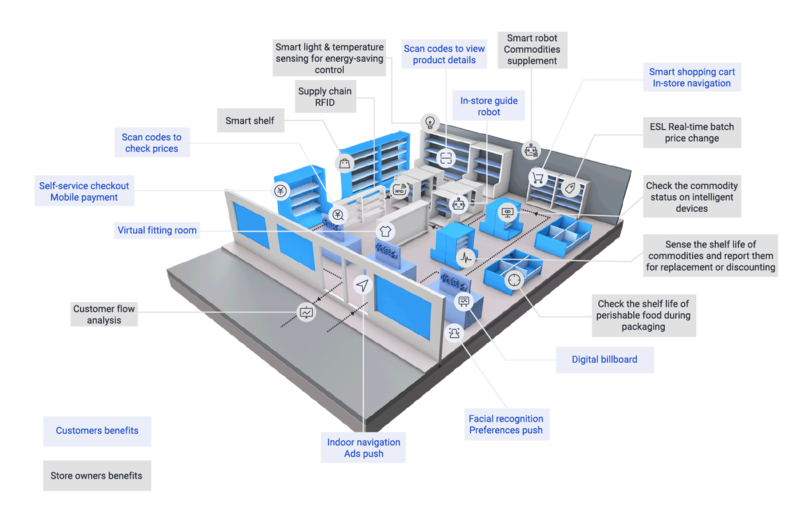 Digitalization is the core feature and is also the foundation of omni-channel retailing and supply chains flexibility. Huawei does not touch applications or data, and espouses full cooperation in the open ecosystem. The comprehensive security protection system provides airtight security. Customer data is never collected and never commercialized without customers' permission. HUAWEI CLOUD Smart Retail has been verified by hundreds of millions of Consumer Cloud users and online and offline Vmall customers. It handles a massive amount of concurrent connections, and handles promotional activity service pressure with ease. Upgrades your services with a wide range of intelligent retail solutions, incorporating Enterprise Intelligence (EI) provided by HUAWEI CLOUD. With the rapid development of e-commerce, an increasingly small share of customer purchases are at brick-and-mortar stores. Traditional retailers must find ways to keep and attract customers in the new shopping model if they hope to thrive amid fierce competition. Traditional retailers focus their attention on goods and store operations. However, the shift in retail business models transforms the relationships between retailers and customers, requiring that retailers adapt accordingly. Isolated IT infrastructures and operation teams fail to integrate online and offline customers, members, commodities, inventories, and orders. Online and offline customer experience is inconsistent. Lacking a unified customer view, traditional retailers cannot identify potential customers and increase cross-selling. Retailers cannot view and analyze real-time operations data. Applies IoT, AI, and big data in retail stores to improve customer experience and sales performance. Builds a unified platform to process and manage front-end and services, supporting retailers and both self-built back-end and third-party e-commerce platforms. Based on global data structure, ensures consistently optimal customer experience, order processing, inventory management, distribution and logistics services, and payment processing. Provides the Kubernetes container platform, one-stop microservice development management platform, enterprise-level cloud middleware, and high-performance serverless functions. Builds a standard front-end architecture to quickly build sites globally. The omni-channel platform is built to efficiently process orders and unify delivery and payment processing. Converges IoT and Wi-Fi, enabling industry digital transformation. Value of integrated offline merchant data increases while user locations form the basis for online marketing. Value of integrated online marketing data is improved by using user behavior data to guide traffic to offline merchants. Professional network planning ensures mall-wide Wi-Fi coverage and strong network signal, optimizing customer experience. In-store navigation, reverse vehicle search, and personalized advertisements keep customers shopping. Electronic shelf labels and automatic update of commodity prices reduce workload by 90%. Smart purchase guides reduce labor costs by 80%. Provides retailers with comprehensive cloud service support, such as IaaS, PaaS, AI, and big data. Integrates with ISV service platforms to help retailers build omni-channel, smart business forms. Highly reliable cloud service product framework safeguards services. High-performance cloud services support rapid service provisioning. Smart cloud services enable smart retail. Uses the application topology and call chain to locate faults in minutes after an application crashes or requests fail. Analyzes application transactions in real time and automatically scores application performance, helping you comprehensively improve user experience.